It is that fateful time of year for me – you know how some people get cabin fever in the winter? I kind of feel like I have the summer version of it, especially right around the solstice. The long days wear on me and I get overwhelmed and listless and irritable because of all the time spent out and about, all the noise of summer. I honestly don’t even think my routine is all that different, but I feel like I’m constantly behind. Even simple, silly things, like preventing backslide from our monumental spring cleaning and running errands wears on me. I greet the solstice (which is next week — hallelujah!) with relief knowing that I’m finally inching back toward earlier sunsets, the quiet of autumn and winter, and the luxury of space & time to be able to think clearly again. While I’ve definitely been chasing everything lately and most of my focus has not been with my craft plans, I’ve still got some irons in the fire, of course, or I’m sure I’d really lose it. I’ve been knitting away on my Broken Wings shawl knit with Be Sweet Skinny Wool. It’s lace so of course it’s not looking like much at the moment, but I’m nearing the end of the first chart which is very exciting. The texture changes dramatically with each chart, so I can’t wait to see it all unfold. 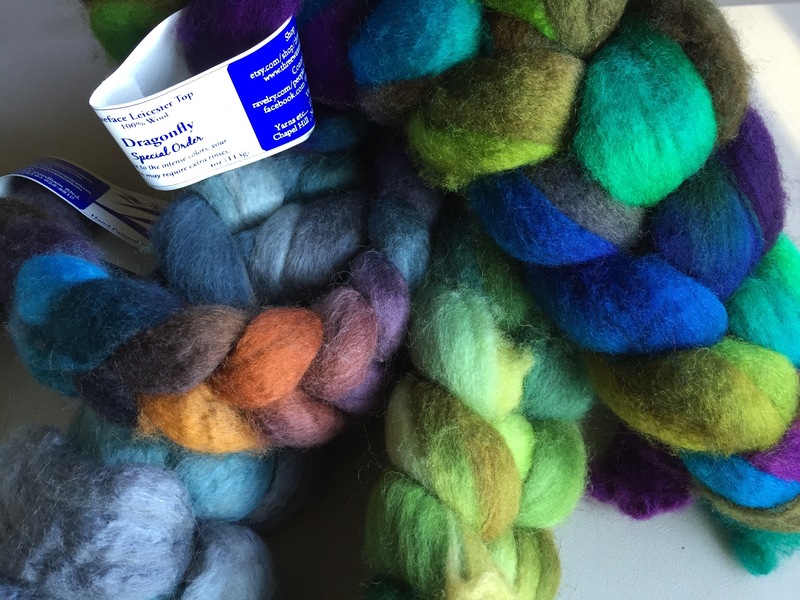 The yarn has been beautiful to work with, so soft and silky — overall, really just such a little luxury! From L to R these are: n-ply (with colors rearranged), gimp, standard 2-ply, single, slub single. There are some funny stories to go along with these, but I’ll wait until I can get these properly washed and get the crazy yellow ties out of the photo so I can really tell you about them and the experience as a whole. You’ll note I have 5 mini-skeins there, so I’ve got one still on the wheel. I’d hoped to have finished it yesterday, but there were complications so now I’m hoping that I can finish today. Cross your fingers for me! I pulled these from my stash this morning and already I’ve realized I have at least 16oz more I need to add to the pile, including the official Tour de Fleece colorway from Three Waters Farm that I’m hopeful will be landing here today. It’s probably good that there’s more to add as this pile is very blue and that does not bode all that well for someone with such a short attention span. On the flip side, that’s kind of a lot of fiber for 3weeks of spinning… I’m going to not think about that right now though. In other fabulous planning news, the first skein of the Feel Good Yarn Co Summer Sock Club arrived yesterday — hooray! It is my favorite skein of SilverSpun yet! I’m hoping to wind this yarn today or tomorrow so I can get knitting. 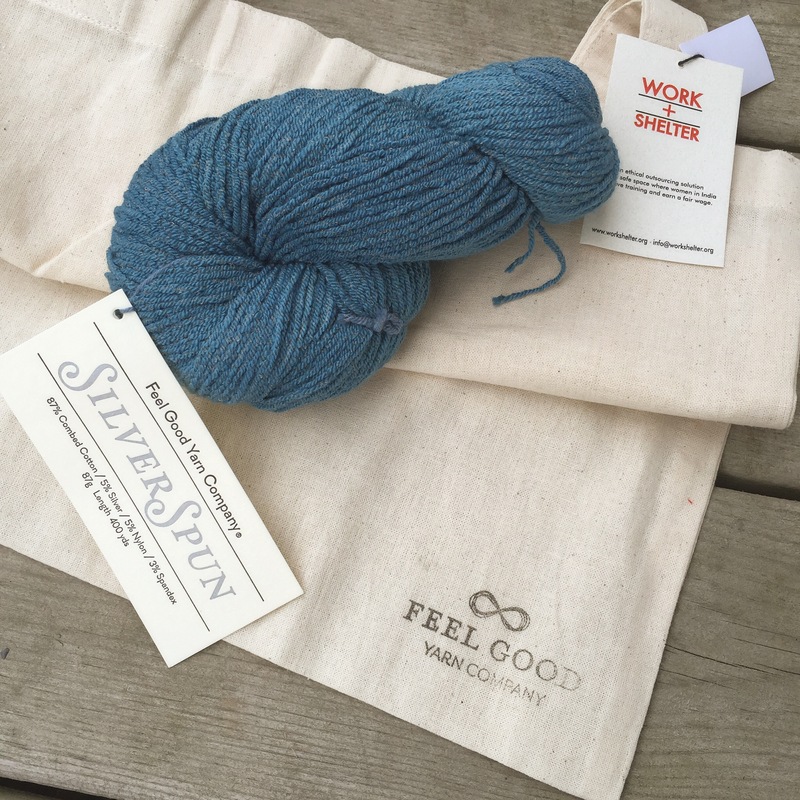 This month’s installment also came with a sweet Feel Good Yarn Co logo tote from Work + Shelter. Especially in summer, I can never have enough totes as I run out the door to one place or another. I love that this one is pretty simple and understated, it’s just such a perfect little bonus for the Summer Sock Club. As I race around today to the bike shop and the grocery store and the bank and to our weekly volunteer gig at the local humane society and I try to squeeze in some time for writing and yoga and walking the dog and maybe even finishing that spinning project, I’ll be trying not to think about the sun as it sets too late in the evening. You can bet that I’ll be thinking about the solstice and it’s significance in my little day-to-day world, every cell of my being is leaning toward that moment when I can feel the shift to shorter, quieter days. I realize I may be in the minority, but I cannot wait. Bring on the solstice, my friends! 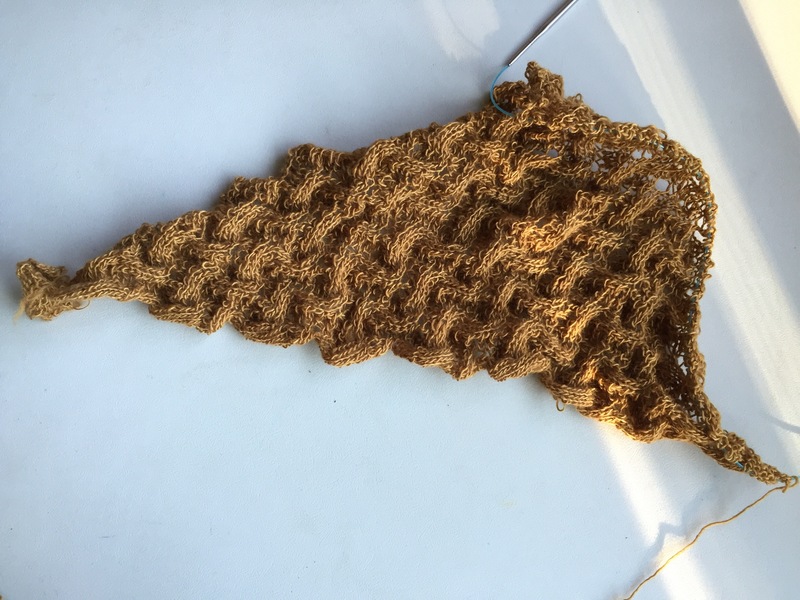 the 1 x6 sal is interesting – I never would have guessed you could do so much with one skein. 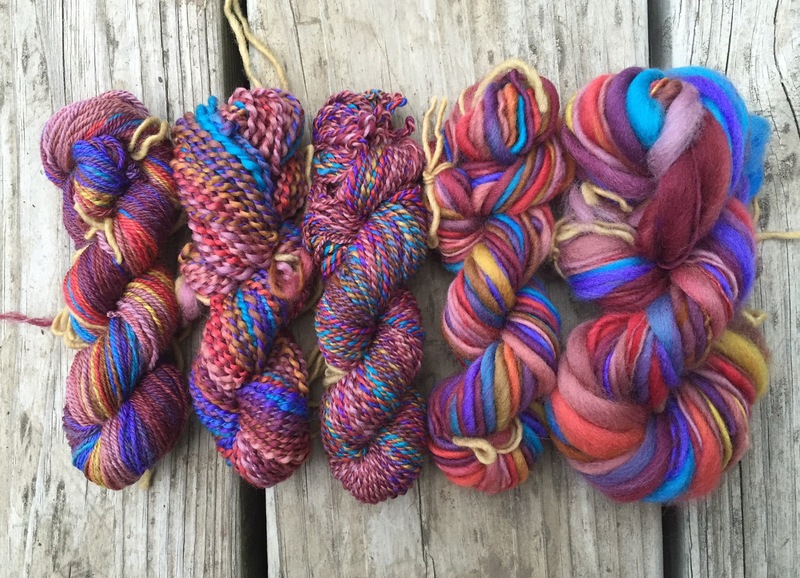 I can’t wait to see what you do with the yarn…or what the 6th one looks like. As for the pile of soon to be yarn – I think it looks great – and there is a lot of green there, too, so don’t let the blue be all you see, lol. The 1×6 has been an awesome education for me. The 6th (cable ply) is definitely the most challenging. I spun it very light and getting the twist right is a little fussy, so I’m kind of having trouble seeing it. We shall see! I’m about 70% done – plan to finish tonight & then wash them all early so they dry outside. I think I’m so much more productive when there’s less light. BUT you’re right, got to enjoy what we’ve got when we’ve got it – in fact I just put a couple beach days in my calendar. That always helps! Beach days are always good! They are! And definitely do check out the cable ply! It’s one of the more complex things I’ve done making yarn, but it turned out all right! You’re so kind! It’s so easy to be critical of our own work! Wow, I don’t even feel like summer has started yet! I’m still very much on a school-year schedule and summer doesn’t feel like it really even begins until the end of June, and you’re already looking ahead to the fall! There is a small part of me that really really really wants to do Tour de Fleece this year and join the TWF team, even though I’m due to birth a human a few days before the tour begins, or a few days after if I have to be induced. I know it’s impossible, but the urge is still strong! Homeschooling makes all the dates weird, I will say that. We finished our “hours” in March and our curriculum was complete by the first week of June for my son & late May for my daughter. It’s amazing how fast they can move independently! Well, I will say that there is an prize for Most Supportive in the group and its meant for those who might not have much time to spin, but cheer on their teammates. Maybe just pick 4oz and if you get to it you get to it? It would be a great way to pass the time if you end up waiting! Ooh I’ll look into that! I am feeling the exact same way! Although, we’ve actually had a cold spell this week in northern California, and it has me so excited for Fall already. Of course next week it’ll be sweltering again. I always say I have S.A.D. (Seasonal Affective Disorder) only mine happens in Summer, not Winter. Hahahaha! I whole-heartedly agree! I also find too many sunny days in a row really difficult. I might be an odd duck! We’ve been having weather whip-lash here — one day it’s 90, the next it’s 60 and there are none of the usual storms in between to break up the constant sun. It’s kinda killing me! When I was a kid, I was fed up with summer by the Fourth of July, and fall is still my favorite season. But I used to get depressed with the shorter days. Now that I live in a sunny area, that’s not an issue. I wish Knit in Public Day were in the fall–it will be 100 degrees tomorrow at our big local event. I love the shorter days. I feel so productive when I’m getting things done before the sun comes up. I often wake by 5, but my body is ready for bed by 9ish — it’s hard to look at my hubby and say, “I have to go to sleep” when it’s still so light out! I am sooooo ready for shorter days & the sun to set earlier, but only because my six month old does not get it and no amount of room darkening is making him get it…the minute the sun sinks, he’s out. I’m with ya, Sarah! Have fun spinning this summer! I always think too much sun feels oppressive. I love the sun and beautiful days, but I need them balanced with clouds and rain or snow or I go bananas. The only time I could handle it is when I lived near the ocean & beach — then the long days and sun made sense to me. The last two nights I went to sleep I gave up and went to sleep when it was still light out — lol! Here’s hoping Mr Harmon figures out the sleeping thing before summer’s over! You must be SO TIRED! I read your blogs the other day and I was tired just hearing about your days!